1 3/8″ OD Pipe Construction, Fully Welded, Extra Wide Trex Composite Steps, Stainless Steel Hardware And Mounting Kits Included, Hot Dipped Galvanized, Built to Last, Easy To Climb Angled Design. 1 3/8″ OD Pipe For Easy Grip, Cedar Steps, Stainless Steel Hardware Included, Built To Last, Hot Dipped Galvanized. Mounting Kit Not Included. 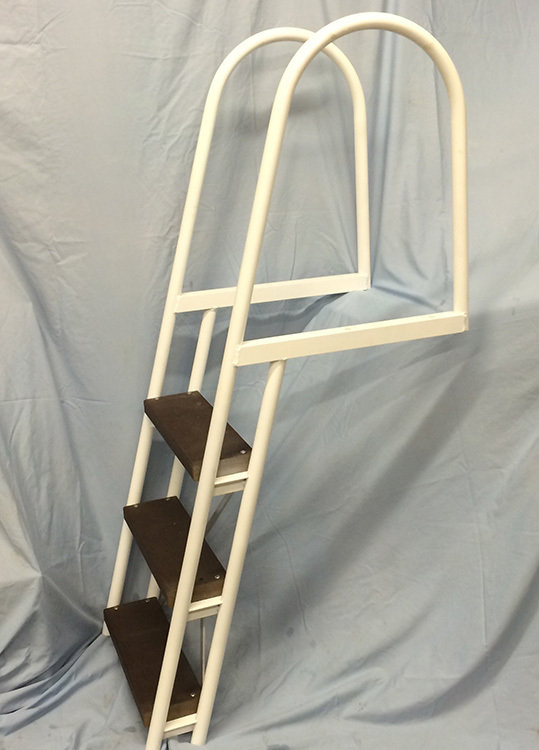 Full size 1 ¼” x 1/8” Aluminum Tube Premium Angled Ladder, Extra Wide Trex Composite Steps, Stainless Steel Hardware And Mounting Kit Included, Powder Coated White, Built To Last, Fully Welded, Easy To Climb Angled Design. 4 Stainless Steel Threaded Rods And All Nuts And Washers Needed For Mounting Any KWIKDOX Ladder. 1/8″ Wall x 1 7/8″ Pipe, Hot Dipped Galvanized, Kwik Cap Included.